Multiple Formula One world champion Michael Schumacher will make his return to the sport driving for the new Mercedes GP team in 2010. The German will race alongside compatriot Nico Rosberg in the rebranded team that took the drivers’ and constructors’ titles as Brawn GP in 2009. News speculation surrounding the identity of the second driver at Mercedes has been mounting for days with the initial rumour pointing to Nick Heidfeld. But it seems that the seven-times world champion was the more suitable candidate to lead the team to another championship success and with Schumacher rejoining the ‘three-pointed star’ he reunites his former racing colleague Ross Brawn, who masterminded all seven of his titles at Benetton and Ferrari. Schumacher’s return to Formula One comes after three years since announcing his retirement at the end of the Italian Grand Prix. Since then, the German still maintains his competitive spirit by taking part in karting event and motorcycle races. Unfortunately in one of those motorcycle races, he suffered a neck injury in a crash. That injury proved a major setback for Michael, as he was assigned to replace the injured Felipe Massa in the Ferrari. Due to his neck injury, Schumacher sadly declined the offer to step-in the F60 and the Scuderia gave the unique opportunity to test driver Luca Badoer and Force India’s Giancarlo Fisichella instead. Michael commented he was deeply disappointed at the time, and it may have been the excitement he felt about returning to Formula One then that helped motivate him to conclude the deal with Mercedes GP. German newspaper Bild is reporting that Schumacher has signed a one-year deal and it is likely he will have the option to continue beyond 2010 if his return goes well. In addition, it is reported that Michael will earn £6.2 million racing the Mercedes GP Petronas Formula One Team – the official team’s title for next season, with the Malaysian oil company announced as a major sponsor. With Michael Schumacher competing in Formula One once again and representing ‘Team Germany’ with Mercedes, the 2010 Formula One World Championship is going to be a fascinating season. To witness the wheel-to-wheel duel against former champions Fernando Alonso, Lewis Hamilton and Jenson Button (Ferrari and McLaren respectively) is going to be spectacular. Hopefully, Michael still has that racing sprint to compete with the young pretenders. From next season, a new points system has been devised for the Formula One World Championship with the top ten drivers awarded points. At present, only the top eight finishers receive championship points with ten going to the winner, then eight for finishing in second, six for third, five, four, three, two and one. With the new points system proposed by the F1 Commission, the race winner will now receive 25 points, then 20, 15, 10, 8, 6, 5, 3, 2 and 1. The increase in points is part of a new scheme to award championship points to the top ten finishers in each race due to the expanded grid in 2010. Taking this new system into account, that means the new Formula One world champion Jenson Button has amassed 230.5 points compared to the actual 95 points he earned in taking the drivers’ title this season. However, the margin of points between each finishing position seems rather inconsistent, with only a two-point difference between seventh and eighth, while only a single point for sixth and seventh. In addition, there is only a five-point gap for the race winner and the driver coming home in second. The importance of winning the Grand Prix should have been made more significant, like 30 points for example. By adopting this idea, the driver behind will push even harder for the overall victory. Hopefully the new system will encourage drivers to overtake each other in the race. Whether it will improve the spectacle remains to be seen. Former Formula One world champion Kimi Raikkonen has joined Citroen’s junior rally team and will take part in the series from next season. The 30-year-old Finn, who left Ferrari a year early at the end of the 2009 season, will compete in twelve of the thirteen rounds of the World Rally Championship driving a Red Bull-sponsored C4 rally car. His co-driver will be Kaj Lindstrom, who was the co-driver for multiple WRC champion Tommi Makinen. 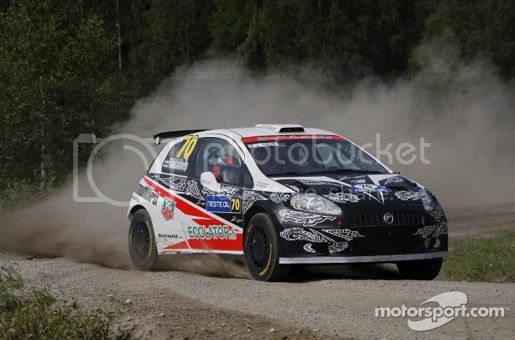 Earlier this year, Raikkonen made his rallying debut in an S2000 Abarth (pictured above) competing at his home event in the Rally of Finland. Despite crashing out on leg two, the Finn earned the respect of the series regulars for the speed with which he adapted to driving on the special stages. Raikkonen has hinted for many years that he was keen to pursue a career in rallying after Formula One, and when the Finn announced last month that he would take a sabbatical following the breakdown of his talks with McLaren, the WRC was seen as his most likely destination. It will be fascinating next season in how the Iceman will adapt to the rally scene including driving sideways!